Richard Salisbury, OD, of Martin, Ky is a real success story for the wound care treatment he received at Pikeville Medical Center (PMC). Dr. Salisbury came to PMC to seek an additional opinion for his diabetic foot ulcer after receiving treatment at a medical facility in Lexington, Ky.
Diabetic foot ulcers occur in approximately 15 percent of patients with diabetes. She says patients who have a wound that has not begun to heal after two weeks or has not healed entirely within six weeks, may benefit from PMC’s advanced modalities. 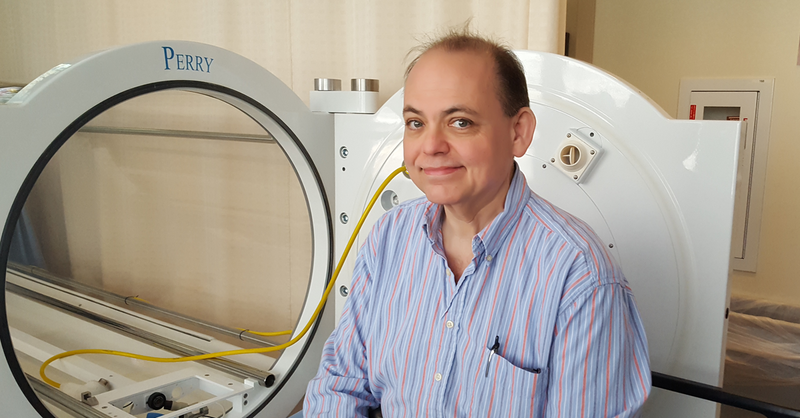 The wound center offers hyperbaric oxygen therapy, MIST® Ultrasound Therapy, cellular tissue-based products and bio-engineered skin grafting, total contact casting and other off-loading means, compression wrapping and advanced wound dressings. Dr. Salisbury met with PMC Podiatrist Mariano Rivera, DPM, FACFAS, and he began treatment on his ulcer by the use of advanced wound dressings, sharp debridement and negative pressure wound therapy to promote healing. He says PMC’s Orthopedic Department, Infectious Disease Department and the Wound Center worked together quickly to get his infection resolved and were able to save Dr. Salisbury’s foot. He says he received highly compassionate care during his treatment. He said the wound center treated him like family and he appreciated that tremendously. Dr. Salisbury says PMC is a top-notch facility. For more information about PMC’s Wound Center or to make an appointment, call 606-218-4721 or visit the Wound Center page.